#10) She is from Chi-Town. Well, actually she's originally from Detroit, however, she currently lives and works in Chicago and has strong ties there. What does this have to do with being a Supreme Court Justice, you ask? Absolutely nothing. BUT guess who else is from Chi-Town...? The guy who gets to pick the next Supreme Court Justice, that's who! So it should come as no surprise that, of the people on "the short list," 3 of them are from Chicago: Judge Diane Wood, Judge Merrick Garland, and Judge Ann Claire Williams. I speak from experience when I say, this is no small accomplishment. For fresh law school grads, their first job out of school is largely determined by their grades - the higher the grades, the more prestigious the opportunities one will have. "Clerking" for a judge (being a judge's right hand man or woman) is considered an extremely prestigious position. Unspoken rule #318: lawyers are prestige-whores. As with most things in the legal profession, within the Clerking world there is a pecking order: federal clerkships are more prestigious than state clerkships, supreme court clerkships are more prestigious than appellate court clerkships which are, in turn, more prestigious than district/trial court clerkships. When Ms. Williams came out of law school she landed a Federal Appellate Court Clerkship in the court where she now serves as a Judge - the United States Court of Appeals for the 7th Circuit (the exact same Court where retiring Justice Stevens was a Judge prior to going to the SCOTUS). 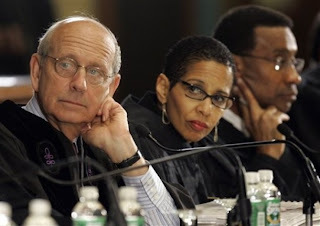 She was one of the first 2 Black people ever to earn a clerkship to that Court. Ms. Williams is a Law Professor at Northwestern School of Law. You might wonder what this has to do with the Supreme Court of the United States but, truth be told, the position of a Supreme Court Justice is very academic in nature. Supreme Court Justices, like Law Professors, are legal nerds. They write Law Review articles about Constitutional theories, policy implications of the law, etc. You could say being a Law Professor and being a Supreme Court Justice go hand in hand. In fact, 7 of the 9 current Supreme Court Justices have been Law Professors prior to being appointed to the Court. Unspoken rule #138: legal academia gets mad respect. There's a saying in law school: The A students become Law Professors, the B students become Judges, and the C students make all the money. There's a lot of truth in that. Ms. Williams got her law degree from Notre Dame School of Law, which is in the top 25 law schools in the country. Perhaps the most shallow "unspoken rule" of them all is this: Supreme Court candidates must be from a "top" law school. So what does "top" mean? According to unspoken rule #89, it means being within the Top-10 law schools as ranked by the US News and World Report, but it has, on rare occasion, included the Top-25. Anything beyond that is unfathomable to the unspoken rules. As you might recall, one of Bush 43's Supreme Court picks, Harriet Miers, was not accepted as a serious candidate and was basically laughed out of contention all because she went to a non "top-ranked" law school (Southern Methodist University - currently ranked #48). Indeed, if you check the current composition of the Court, 5 went to Harvard Law School (currently ranked #2), 3 went to Yale Law School (currently ranked #1), and 1 (the soon-to-be-retired Justice Stevens) went to the same Law School where Ms. Williams is currently a professor: Northwestern (currently ranked #11). Just as Sonia Sotomayor had a record of service to the Latino Community, and Samuel Alito had a record of service to the Italian Community, Ms. Williams has a solid resume of service with the Black Community: she's a Delta, she's provided countless hours of pro bono legal services to Black folks in inner city Chicago, she was the first Black female supervisor in the US Attorney's Office in her district, she has led several Lawyers Without Borders delegations to the countries of Ghana, Kenya, and Liberia. Not to mention, if she is selected then we will have, for the first time ever in the 200 year history of the United States, 1/3rd of the Supreme Court made up of women. Currently all of the focus is on Solicitor General Elena Kegan, Judge Diane Wood and Judge Merrick Garland, therefore the Right is busy focusing all of their energies on those A-Listers. A perfect reason to slide Williams in at the last second while they're distracted. Perhaps the #1 complaint that Republican Senators love to use in order to attack a judge who they perceive to be liberal is to make the claim that the judge is "an activist Judge who legislates from the bench." "Legislating from the bench" is an insult to a judge because it means that the judge has crossed the separation-of-powers line in the sand by creating a new law which is solely the job of Congress. Congress creates the laws; the Courts are only supposed to interpret those laws, not make up their own. With respect to this issue, Ms. Williams has been quoted as saying: "I've written on thousands of cases across the board, and I think it would be hard to type me. I don't think there is a type. I am not in Congress. We don't legislate in the courts." Although her second appointment to the Federal Appellate Court came from President Bill Clinton, her first appointment to the Federal District Court (trial court) came from none other than the Grand Puba of them all, Republican legend, President Ronald Reagan! This makes her an unassailable candidate to Republican Senators lest they be branded as going against the greatness that is Reagan. That would surely be blasphemous. So there you have it, folks. 10 reasons why Ms. Ann Claire Williams just might mess around be become the next Supreme Court Justice. Could this be our next Supreme Court Justice? Give your 2 cents.